The Dutch are doing it again! On June 1 1963 the last city gas connection was turned of in the Netherlands, 55 years later Greenpeace spearheaded a new Dutch Hydrogen Coaltion (Waterstof Coalition) of the main power and eletricity and gas net operators, as well as chemical, electrolyser, and steel industry to operate 3GW electrolyser capacity in 2030. The Coalition presented the Dutch minister of Economic Affairs and Climate with a clear set of set of recommendations to link its [email protected] budget to large electrolysis plants and network development to bring down H2 costs to around €3.oo in 2030. The Dutch gas network could by that time be operational to transport hydrogen. Preliminary large scale experiments in the West of Holland look promising. First demand will be created by industries that use hydrogen as a feedstock, transport will kick in in parallel. An estimated 40GW electrolyser capacity in the whole of Europe could be installed by 2030 to link rnewabel power to clean hydrogen demand. . The Coalition reflects the big acceleration of interest and commitment in the Netherlands spurred by the launch of the first EU Synergy project TSO2020 that landed in the Northern Netherlands last year, connecting big wind and solar capacities to EU transport corridors. 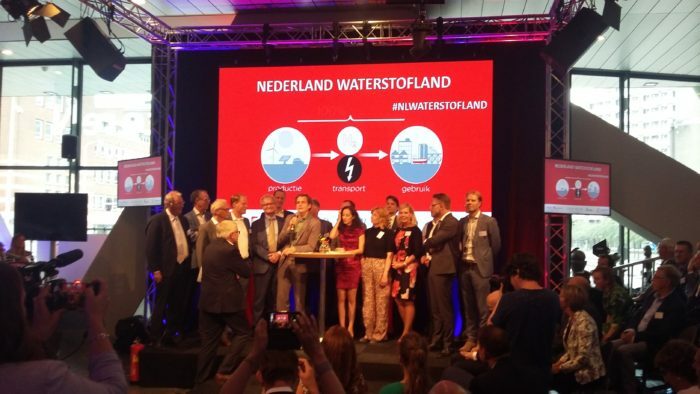 Dutch minister Wiebes invited business to “move on up”, the title of a big Dutch mobility Festival the day before where a convenant on “Hydorgen deployment” was signed and funding for 8 new hydrogen stations announced.